One of the great treasures of the entire National Park System is Glacier Bay National Park and Preserve. Located in the Alaska panhandle just west of Juneau it covers 530 sq. miles or 3.3 million acres of rugged mountains, spectacular glaciers, temperate rainforest, wild coastlines and deep sheltered fjords. It was designated a National Monument under the Antiquities Act in 1925 by then President Calvin Coolidge and expanded substantially by President Jimmy Carter in 1978 leading the way for its designation in 1980 as a National Park and Preserve. In 1979, Glacier Bay was designated a UNESCO World Heritage Site and inscribed as a Biosphere Reserve in 1986. The story of Glacier Bay and Alaska is not complete without reflecting on how the United States came to acquire Alaska. It seems that Russia, who actually owned what we call Alaska today, was in financial straits and in 1867 sold Alaska (some 586,412 sq miles) to the United States for the sum of $7.2 million dollars or 2.0 cents per acre. Then U.S. Secretary of State, William H. Seward, was instrumental is pushing the deal through Congress though many called it “Seward’s Folly or Seward’s Icebox”. I am quite sure that Russia has forever regretted making that deal. Back to Glacier Bay. No roads lead to the Park and it is generally reached by tour boats or small aircraft which land at the tiny village of Gustavus near the entrance to the Park. Glacier Bay is named for the fifteen tidewater glaciers that descend from high snow capped mountains to the bay where large blocks of ice break off (called “calving”), some as large as houses, and crash into the icy waters. The entire region has been and still is being lifted by tectonic forces and subsequently eroded by earthquake induced landslides. 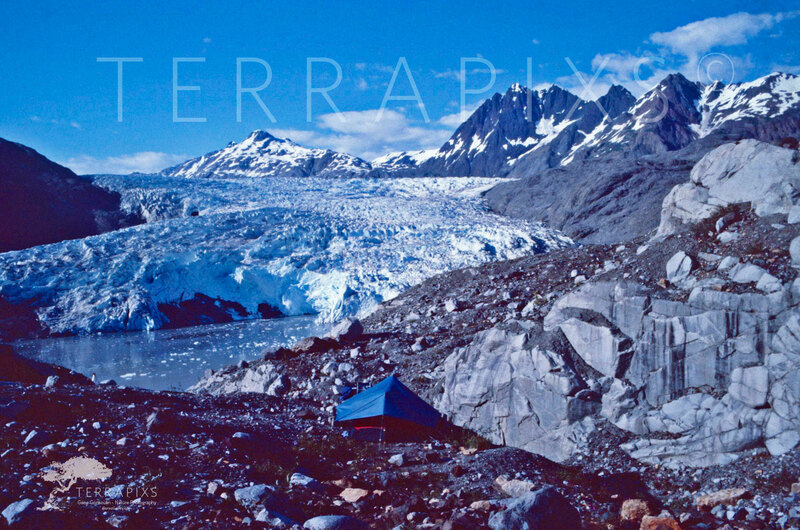 Ecosystems in the Park include wet tundra, Alpine tundra, coastal forest brimming with Sitka Spruce, glaciers and icefields. Wildlife abounds including grizzly and black bears, moose, wolves, Canadian lynx, cougars, sea otters and sea lions, whales and eagles to name a few. It always better to stay on the Parks well marked trails since humans are fair game for the many carnivores seeking a meal. It was a beautiful day in late June when we set out with our backpacks from the Park’s primitive camping area. We boarded the forty foot tour boat at Bartlett Cove near the Park headquarters along with twenty or so tourist and headed into the east arm of Glacier Bay. I will never forget the looks on our fellow passengers faces when the boat pulled right up to Riggs Glacier and lowered a gangplank for us to get off. “You’re getting off here!”, one exclaimed, a very disbelieving look on her face. Indeed we did get off (by prior arrangement with the Skipper) backpacks and all. As the tour boat backed away we waved goodbye to the now wide-eyed passengers. Exploring Riggs glacier (carefully though) was nothing short of fantastic, ice caves and all, and late in the day we pitched our small tent a stones throw from the Glacier as seen in the picture. The Glacier was moving all night in its march to the Bay. Every two or three hours a booming sound rocked the landscape as ice gave way to tremendous weight and pressure. It was a humbling experience that I would highly recommend to anyone. While it is easy to sit in a recliner and watch the ball game in doing so we often miss what life is all about and the untouched beauty of places like Glacier Bay. Life is short, go and enjoy!